As Farnborough 2018 gets underway, specialist consulting firm and leading aircraft appraisers IBA, predicts likely orders for the airshow, and analyzes historical data to reveal the probable results from the aviation industry’s premier showcase. 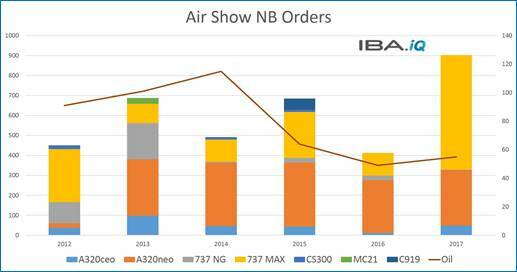 In brief, IBA forecasts: an order tally (firm and MoU) that tops 900; strong orders for the neo and MAX families – with a bias towards the A320/A321 and -8/-10 variants; improving orders across both the Q400/ATR families and some sales for the E1 and E2s, although it may be too early to reap the benefits of the Boeing announcement; a little movement on the Bombardier C Series program for both variants but this may not lead to firm/MoU level commitment;100 orders across the 777, 787, A330 and A350 families would be a good result; the Boeing NMA (New Midsized Airplane) and the C Series stakeholder changes should spark up some interest, but IBA considers it may still be too early for the NMA launch; and, in terms of buyers, lessors will take around 40%. 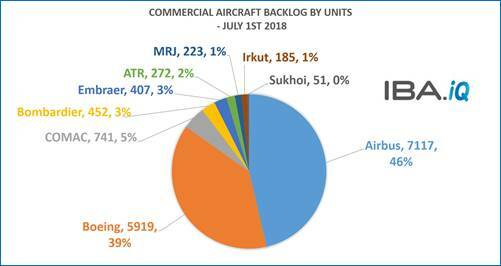 Dr Stuart Hatcher, COO at IBA Group observes, “If we look at potential orders, first it is staggering to note that the current backlog for commercial aircraft airframers as at July 1st 2018 stands at 15,367 aircraft, a number that is almost 1,000 units higher than the same point last year. The breakdown by OEM is shown in the chart below. 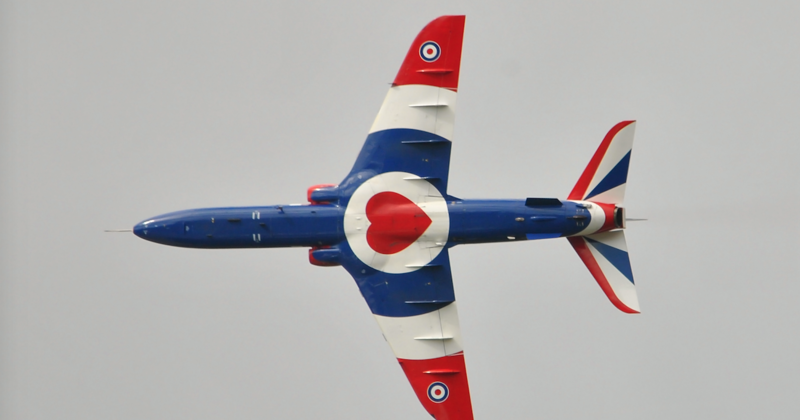 “Over the past six summer air show seasons, Paris and Farnborough have accumulated 5,244 firm orders and MoUs, with a further 1,183 options across the nine commercial airframe OEMs shown above. This equates to around 30% of the total number of aircraft ordered since January 2012 with between 30-50% taken by the lessors over the same period,” adds Hatcher. 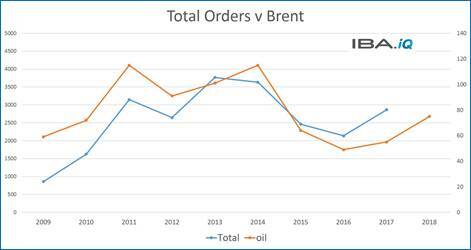 IBA emphasizes that although it is possible to draw a correlation between many things, since the global financial crisis and start of the current aviation cycle the trend between oil price and annualized orders has been uncannily strong. This is unsurprising considering most orders have been placed for new fuel-efficient technology. Yet even with such large order backlogs in play, orders continue to come in as the oil price rises. Increasing air traffic plays a fundamental role in the growth of orders too, but it is more challenging to draw direct comparisons of how each year moves. Traffic has been rising between 5.3% and 8.10% year on year since 2010, and growing in an upward trend since 2012. This year air traffic growth is set to close at around 7%. According to IBA, the pricing gap between the largest narrowbody and cheapest widebody aircraft is not very wide and airlines will only want to pay narrowbody seat prices. There is a largely untapped 2,000+(nm) range market that has yet to be explored in any depth by two airframers or two engine OEMs, and Airbus and Boeing may come at this in different ways – development versus pricing pressure. Of the airline customers, IBA has recorded huge variety over the years, sometimes with the most unlikely candidates placing decent sized orders alongside the usual commitments from LCCs and legacies alike. It is easy to forget that Monarch placed a 15 x 737 Max 8 order last year just three months before going out of business. For some airlines where competition is particularly strong and/or overheads are high, there is trouble ahead, predicts IBA. To combat fuel price increases, buying the latest fuel-efficient aircraft may provide the natural hedge, but rising capital costs will make other airlines wary of spending. But as IBA points out, buying aircraft today is not about the current market, it concerns securing market share beyond 2025. And with backlogs ever increasing, all large carriers will want to cement their position if their competitor has already started to do so. 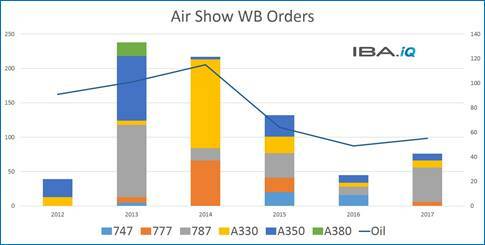 Switching to widebodies, despite a huge amount of development, IBA does not foresee much positive movement this July unless OEMs provide a pricing incentive. Notwithstanding growing traffic levels and a rising oil price, many operators may still wish to hold onto what they have and see where the market moves. 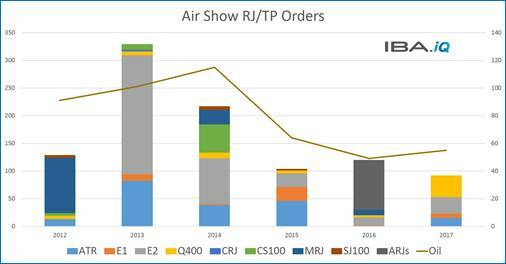 As IBA examines the other end of the scale, it is evident that smaller regional aircraft have not attracted much attention at Paris or Farnborough Air Shows since 2013 when the Embraer E2 made its entrance. The order book for ATR and Embraer has been declining ever since. As fuel started to collapse, so did the impetus towards fuel efficiency. 2016 was the lowest point and ATR failed to record any firm orders at Farnborough. Last year was a little better in Paris but the total still failed to reach 100. Seymour explains, “Unlike narrowbody aircraft, backlogs for the regional jet/turboprop markets can be cleared more quickly (2-3 years), so operators tend to buy aircraft when required. With the exception of NAC, this space does not tend to attract speculative lessor/buyers, unless there is a political angle. The current RJ/TP market is experiencing a period of oversupply, so it may be yet another tough year. Another obstacle to be recognized is that the MRJ/larger E2 cannot get over the scope clause hurdle which is happily covered by the E1 and CRJ aircraft families. A way round that would be a game-changer, but IBA does not expect the unions to shift their position anytime soon. On a positive note, there should be a new spring in the step for the Bombardier C Series, which has now got a new majority owner and access to the Airbus marketing machine, and let’s not forget the Boeing-Embraer connection too. Whilst it is too early to expect any push from the Boeing machine as the ink is barely dry, we may see some real pricing plays in the near term to push the E2 harder into the market. The build-up to this Farnborough Air Show has already seen over 800 orders across all OEMs, which is higher than the past four years. Given oil price increases and the tightness of the narrowbody market, orders will be strong for the neo and MAX families – with bias towards the A320/A321 and -8/-10 variants – and being wary on some artful conversions from MAX 9s. 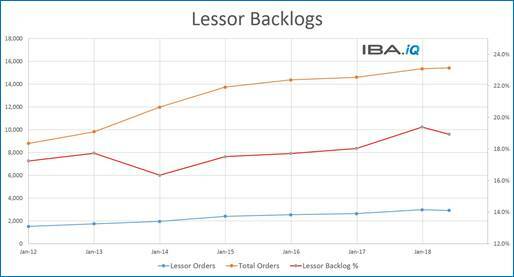 IBA expects to see a small handful of ceo/NGs orders, but not many. Seymour summarizes, “We anticipate around 600 firm and MoUs for the neo/MAX families, with a total of 20 for the ceo/NGs. We expect to see around 70 aircraft ordered across both the Q400/ATR families and some action on the E1 and E2s – but only 30-40 between them in the current climate. We hope to see some movement on the C Series program for both variants but it may not lead to firm/MoU level commitment. It is unlikely that much will happen at MRJ until the aircraft enters service. “At the upper end of the market, around 100 orders across the 777, 787, A330 and A350 families would be a positive result. The bias will edge towards the A350s and 787s, with a smaller number of buyers going for A330neos and a few towards the 777 family. If there is a surprise, it could come from the widebody space.